Sign Our Digital NDA by Clicking Here. 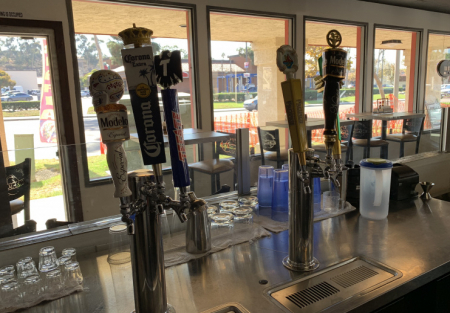 Here is the turn key Mexican food or sports bar location you have been looking for. Located on extremely busy street and super busy center National City. Restaurant has a prime corner location giving it great visibility from both sides of the road, in addition to the large monument sign they are listed on. Seller built this restaurant out to add to his restaurant inventory but has not been able to run it profitably due to staffing issues. Needs a full time owner/operator dedicated to running a successful restaurant or sports bar, is that you? Are you looking to owner operate a restaurant in a super busy center and take the keys for a near new restaurant? Avoid the extra costs and endless delays of building a place out on your own. Keep the name or change it out to your own, this place is ready for you now. Go Visit This Restaurant by Clicking the LINK. Has a nice bar area, three large screen T. V’s and lots of windows. Ideal set up for current concept or the next neighborhood sports bar. Kitchen is ready for volume with a 20’ hood system, six burner stove, griddle, two deep fryers, cold prep table and a walk in cooler and freezer. It’s all here ready for you to take over and get this place going. Seller states monthly sales are trending up and in the 30k range. Restaurant is approximately 2000 square feet. Current lease term expires in 2022 with a five year option available. Rent is $5056/month and CAM is $1240/month and includes water and trash. If you have been looking in National City or the South bay San Diego area in general, you need to come see if this is the restaurant you have been waiting on.